The 2019 could be the perfect family minivan for you to drive around Lewistown. With many options to choose from, Frey Motors will help you understand which make, model, and color could be perfect for your driving needs. The Chrysler Pacifica was created to impress and is a stylish minivan you'll be proud to drive. 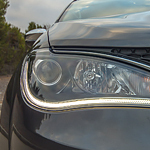 You can choose daytime LED running lamps and HID headlamps for improved visibility at night. The tri-pane panoramic sunroof will make driving a pleasure for all of your passengers. They'll be treated to large amounts of natural light and have great views in all directions. For safety, the Chrysler Pacifica is built from dual-phase high-strength steel that will stand up to any of your driving needs. You'll also be protected from impacts from any direction in case of an accident. You can have peace of mind when driving the Chrysler Pacifica.